When you come to Marino’s, you will be pleasantly surprised at our menu. Our specialty is our Award Winning (Alive Magazine) Fish & Chips. Our fish is lightly battered and deep fried “Calabash” style. We serve a thick cut fry, and two very sweet hushpuppies. You can also have a side of our Homemade Cold Slaw. Some of Marino’s Specialties include: Award Winning (Columbus Monthly) Fried Smelts, Mediterranean Baked Fish and Poached Fish. Our freshly made Salads are made with iceberg lettuce and assorted greens. We also have our famous Homemade Thick Fish Chowder. Each day at Marino’s we have a different special. 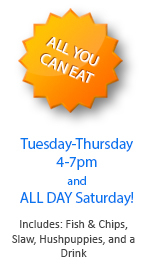 We also offer ALL-YOU-CAN-EAT Monday-Thursday 4-7pm and ALL DAY Saturday! This includes our Fish and Chips, Slaw, Hushpuppies, and a Drink. For over 25 years Marino’s Seafood Fish & Chips has been servicing central Ohio, particularly the Grandview, Upper Arlington and the Northwest side of town. The community has embraced us with open arms to all we have to offer. The staff and I believe we are here for you, our customers. To serve you fast, to serve you with the utmost courtesy, and to assure you will have spent your money wisely and not have been disappointed. We know you don’t have to be the biggest to be the best. We don’t have all the bells and whistles to help make a statement. We know that with the hard work and a friendly atmosphere, we can service all your lunch or dinner needs. We believe we have a dinner for everyone. So if you and your family are in the mood for something other than burgers, pizza, and all the others, then please do yourself a favor and come for a visit. The staff and I look forward to serving you and making you not only a customer, but a friend. I've been coming here for years! This is the best Fish & Chips in town. This is the only place my husband will eat. We like to go to Marino’s because they have the best Fish & Chips in town and at a reasonable price, along with the friendliest service. I’ve been coming here forever. The food and service is just great. I feel as if they're family! Definitely the best Fish & Chips in town! I’ve been here so many times I’ve lost track and it’s always wonderful! The staff is always friendly, the dining room is super clean and the Fish & Chips are #1! I compare the poached fish to a filet mignon... consistently delicious. I have been coming in for lunch on Fridays for years. The atmosphere is always friendly and the place is spotless! Harry and his crew make you feel like you’re part of the family! The food’s great too! © 2018 Marino’s Seafood. All Rights Reserved. 7UP is a registered trademark of Dr Pepper/Seven Up, Inc.